Some IT organizations prefer infrastructure solutions that offer simplified cloud deployment models for their digital transformation projects. 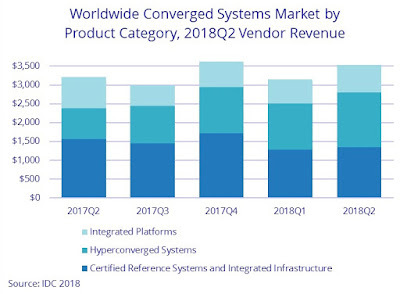 According to the latest market study by International Data Corporation (IDC), worldwide converged systems market revenue increased 9.9 percent year-over-year to $3.5 billion during the second quarter of 2018 (2Q18). "Data center infrastructure convergence remains an important investment driver for companies around the world," said Sebastian Lagana, research manager at IDC. "HCI solutions helped to drive second-quarter market expansion thanks, in part, to their ability to reduce infrastructure complexity, promote consolidation, and allow IT teams to support an organization's business objectives."